1. Mix together the bourbon, garlic, 1 tbsp rosemary and 4 tbsp barbecue sauce. Add the prawns and marinate for 1 hour, covered and refrigerated. 2. Place the remaining barbecue sauce in a pan with 300ml water plus the rosemary and bring to boil. Add the rice and cook gently for 12-15 minutes, stirring occasionally. 3. Cook the corn on the cob on the barbecue or griddle pan for 8-10 minutes until just charred, then cut off the kernels and add to the rice. 4. 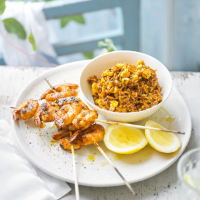 Thread the prawns onto 4 skewers and barbecue or grill for 4 minutes, turning once until cooked through. The shell should change from grey to bright red with the prawn meat white and opaque. Serve with the barbecue rice.